AKA Revenge of the Planning Post! It’s that time of year again, folks! A little more than a month until Dragon*Con! 41 Days. This of course means time to get serious, if not start to panic a little. A snapshot of my D*Con costume list for 2013… It was crazy. I’m working on my 2014 one now. 3 – Room Deposits – If you are the room holder for your group, this is CRUCIAL!!! When I do it, I keep a running tally of what each person has paid me for their share of the room. I let them pay in increments as they can, with a deadline of August 1st. This way people have time to pay and they risk losing their spot if they don’t cough up the dough. And also that way no one gets overcharged because I have an accurate running total with formulas in the spreadsheet calculating what their remaining total is. While this one doesn’t change that often, I feel like it is one of the most important spreadsheets. 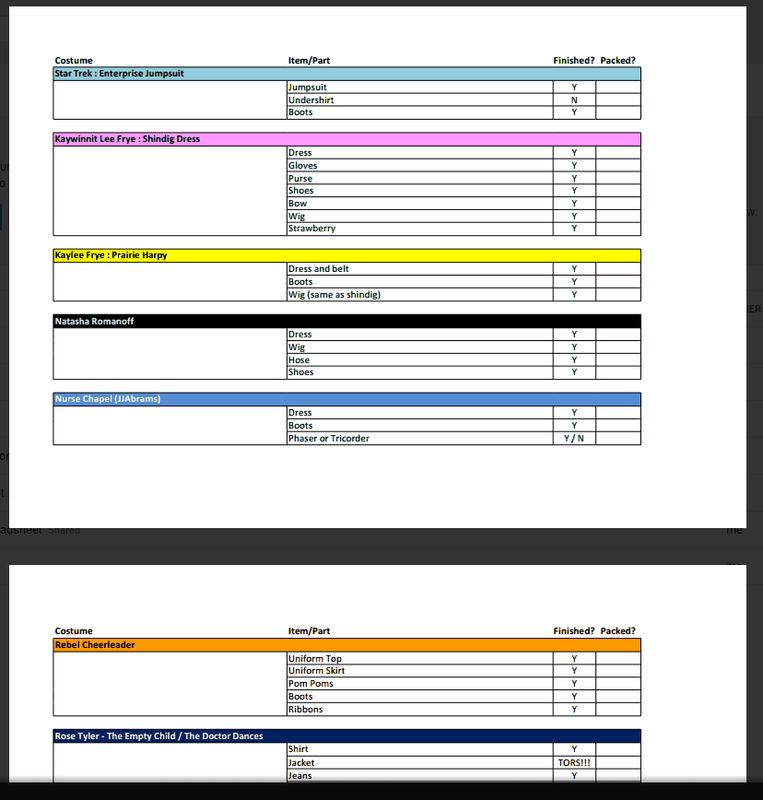 Now one may think that with ALL of these spreadsheets, how can anyone focus on the fun of Dragon*Con? It’s actually not that difficult. The costume list gets chucked once everything is packed and ready to go! That puts me at 2. Everyone should have paid their share of the room by the time I get there so that cuts out another one. That only leaves me with the schedule which I usually just print out and go from there. And I stray from that schedule quite a bit. I use categories like “MUST GO”, “Want To Go”, and “Maybe Check Out”. It’s easy. And color coded. It fits my OCD quite well! –A 2014 side note: I really recommend downloading the Dragon*Con app for your phone! It’s available in the PlayStore and AppStore. Here you can add your schedule, add friends, check out what they’re doing, and even write reviews! It’s seriously handy and has gotten rid of my paper schedule for the most part. Woohoo! Next post – Surviving at Dragon*Con!!! Next Crowdfunding Cosplay? Are you Serious?